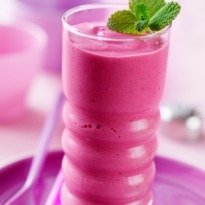 Beautiful to look at and yummy to taste this beetroot milkshake with cinnamon and vanilla ice cream is sure to win hearts. 1.In a blender puree the beetroot. 2.Add sugar syrup, milk, crushed ice and cinnamon powder. Blend. 3.Add vanilla ice cream and mix.